You may have noticed that a new product recently popped up on Trump’s reelection campaign website: a golden coin with Trump’s face on one side and “Make America Great Again” on the other, that sits on a “Blue Kraft box” that has the Trump/Pence logo on it and…I’ll stop there, you get the picture. It costs $45. The medals are also featured prominently in a three-minute video posted to Trump’s Youtube channel on Wednesday, which is ostensibly supposed to get viewers excited about an executive order he signed in June that doubles the amount of money the government spends on apprenticeship programs, thus theoretically creating more apprenticeships (an initiative Ivanka pitched in on a lot, reportedly). That’s pretty sweet product placement, if true. Sounds like money. 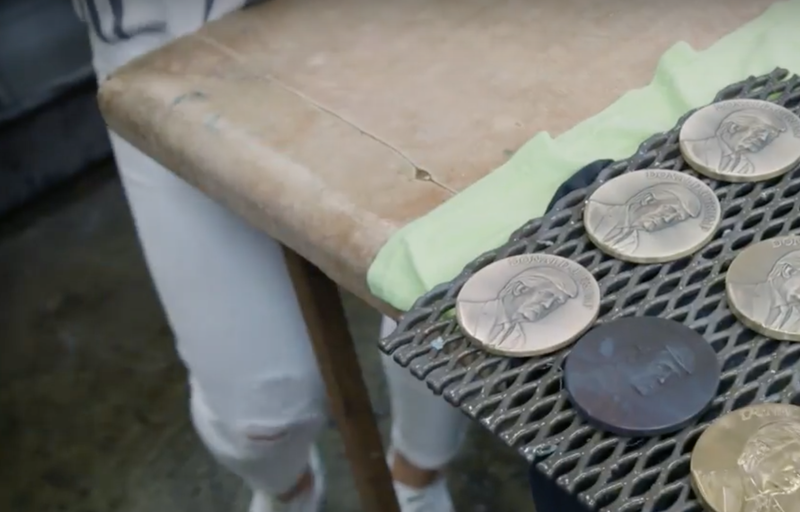 Anyway, as usual with this administration, I have little clue what’s actually going on, but the video certainly suggests that Trump’s apprenticeship program is being used at least in part to make medals with his face on them, sold for too much money to raise funds for his reelection campaign. I just don’t know what other conclusion to draw at the moment, but maybe the administration will fill us in never. And is that woman in the final shot winking repeatedly as she delivers her lines? I think so.